Sky will broadcast the Queens Park Rangers #Game4Grenfell charity football match in aid of the West London community affected by the Grenfell Tower fire. Part of an afternoon of special programming on Saturday 2 September, #Game4Grenfell will see former football professionals, celebrities and special guests play a 90-minute match at QPR’s 18,000-capacity Loftus Road stadium in Shepherd’s Bush, the closest league ground to Grenfell Tower. The game will be shown live on Sky 1 and Freeview channel Pick, with the event kicking-off with a special pre-match show featuring players and pundits, alongside those affected by the events in West London. A number of well-known personalities are lining up to take part in the afternoon’s events including Olly Murs, Tinie Tempah, Jamie Dornan, Jarvis Cocker, Danny Jones, Les Ferdinand, David Seaman and Alan Shearer. Peter Crouch is confirmed to feature alongside his childhood friend Gregg Jules, a fire-fighter who was directly involved in the relief effort. Sky Sports’ Chris Kamara will match report on the day. “Through the power of football, the aim for #Game4Grenfell is to raise funds for those affected by the tragic events of June,” said Philip Edgar-Jones, Director of Sky Arts and Entertainment. 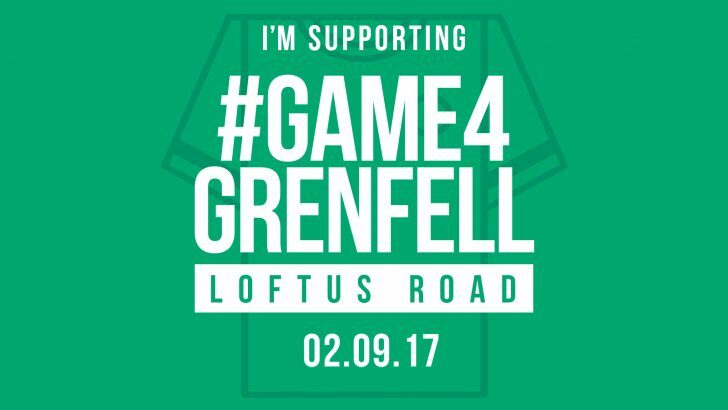 Tickets for #Game4Grenfell are priced £15 for adults and £5 concessions. Visit www.game4grenfell.com for more information on how to buy tickets. Money raised from ticket sales will be passed directly to the London Community Foundation for allocation to the Evening Standard Dispossessed Fund, distributing funds to survivors and the wider community affected by the fire. Viewers at home will also be encouraged to text in donations. #Game4Grenfell is the brainchild of QPR Co-Chairman Tony Fernandes who has worked alongside QPR Director of Football and former football player Les Ferdinand to put the event together. The former England striker grew up on an estate close to Grenfell Tower and the pair are joined by Columbia Records’ Ferdy Unger-Hamilton. #Game4Grenfell will be shown live on Sky 1 and Pick from 2pm on Saturday 2nd September.